Q&A... What's the Best Way to Cope with Small Kids on a Long Flight? First off, recognise your children’s needs and interests as your own. Let your children know about your holiday plans. Let them know where you want to go, how you are going to get there and how long it will take. Trace it out on a large map (for younger children you can show them the distance between home and away using a toy car and plane) It will offer them an added sense of security and a btter idea of what to expect from the journey. Ahhh, now to the eternal question of ‘diversion therapy’ during flights. One of the most frequent queries I get is about the use of sedatives. An antihistamine is often prescribed solely for its soporific effect - as a mild sedative and occasionally for fractious kids on long and tedious journeys. If you are considering using an oral antihistamine for this purpose you will need to weigh up the advantages against potential contraindications and also be aware that children can react adversely, becoming cranky and overactive if the dose is not right. I experienced this for myself with my own son and it only served to make matters worse. What is more you’ve got to consider the effects of jet-lag used in conjunction with a sedative. If your child sleeps throughout the flight, will this really help him to be ready for bed at the normal time once you arrive at your destination? A few drops of lavender, chamomile or marjoram oil on a favourite blanket or pillow can help relax a child and help promote restful sleep and has helped ease me through many a flight. As for ‘Are we there yet?’ syndrome, you can be sure flying isn't as easy as it used to be – seats are much closer together and planes are much fuller. Whilst it is even more of a challenge with little ones there are things you can do to make your time in the air go more smoothly. In-flight comfort is key, so select your seats wisely, and early. For younger children and babies I swear by the bulkhead seats. Being in the front row provides extra leg room, and no passengers in front of you to kick. Almost every international carrier provides a bassinet (or sky-cot) that attach to the bulkhead for babies under 10kg. You can normally pre-book these cots. if you don’t need a cot you'll need to arrive at check-in early to snag a bulk-head. Among airlines that do pre-assign bulkhead seats, many reserve them only for frequent fliers. Still, it never hurts to ask. At check-in it is often worth asking for a place with an empty seat between you and your children so as to allow for maximum stretching-out space. Smart packing is important. First off, prepare for spills. I’ve learned to bring an extra set of clothes for both parent and child and a plastic bag for dirty garments. Order special meals. Ask about special kids' meals - some flights have them, some don't. Order at least 24-hours ahead, but be prepared with sandwiches and some non-mulchy snacks anyway (raisins, carrot sticks, cereal, fruit bars etc..); kids' airline food can be as bad as the grownups'. For our slightly older child aged 3, a kid’s personal media player always goes down well as does a disposable camera. 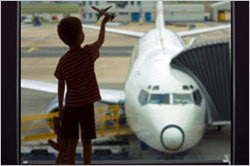 For most kids the anticipation of getting to their holiday destination is more than they can bear. Children have little appreciation of either time or distance. The question mums ask me most is just how to keep them amused, especially during long flights, train rides and car drives. The reality is how your kids behave on the journey largely depends on their boredom threshold and how well prepared you are to tackle the situation. If you end up getting agitated and bored, the chances are they will too. These tips might just help save the day. 1. A disposable, automatic camera for a kid’s eye view of the trip. 2. A portable media player with individual headsets so they can play their own blend of tracks without driving you insane. 5. There is no escaping it. Over the age of 4, a hand-held electronic game has to be top of the diversion list. • Hand puppets for their versatility. They are always a mood lifter. • Non-stain, washable colouring pens. Enough said. • Toys with a seriously heavy battery consumption. • Play dough which smears, squelches, stains, dries up and cracks. • Talking toys with a mind-numbingly repetitive tone and limited vocabulary. Best Airports to Be Stuck At.. With Kids in Tow..